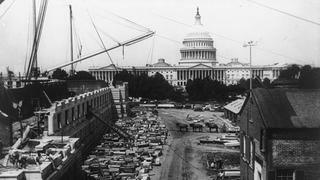 Construction of the Northwest Court of the Jefferson Building of the Library of Congress. Photograph taken on July 10, 1891. This story was republished on CityLab. Find the original version here on The Conversation. What do Ron Paul, Nancy Pelosi, and President Donald Trump have in common? They’ve all promised to “drain the swamp” of Washington politics. George Washington knew exactly what he was doing in early 1791 when he led the three-member commission that Congress had authorized to pick the site for the nation’s capital. 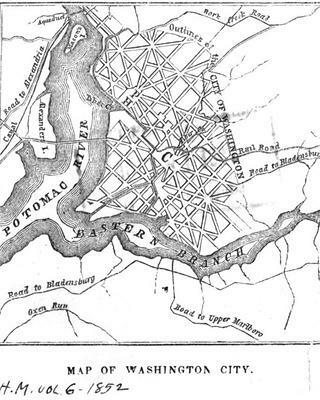 There was never much doubt that the new federal district and city would be near the head of navigation on the Potomac River, adjacent to the thriving port town of Georgetown and well away from the squishy margins of Chesapeake Bay. Washington knew the region intimately as a nearby landowner and resident, and the site for Washington looked much like his home at Mount Vernon—a rolling riverside terrain of old tobacco fields. Pictorial panoramas of the city proliferated during the 19th century as ways to instill national pride in Washington, and are one of the best sources for understanding early Washington. "City of Washington from Beyond the Navy Yard." Leaf through the images in the Library of Congress and you’ll see a dry landscape with buildings that would not have survived to the present had their foundations been sunk in muck. The Smithsonian Castle, for example, has been standing straight since the late 1840s. Map from Harper’s Magazine, printed in 1852. The truly muddiest episode in Washington’s development came in the mid-19th century. After the Civil War, decades of farming in the Potomac River hinterland led to erosion that sent masses of silt downriver. 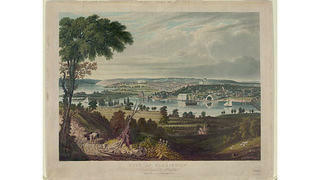 As the Potomac slowed below its last rapids—where the river entered the District of Columbia—the silt precipitated into massive mudflats on the city side of the river. Politicians who have spent any time in Washington should know better. After all, the city is filled with neighborhoods with names like Friendship Heights, Mount Pleasant, Columbia Heights, Crestwood, Washington Highlands, and “fine view” (Kalorama). Having summered in Washington, I’m not writing to defend the climate. But a steam bath does not make a swamp. I don’t expect the facts of Washington’s historical geography will fully undercut a catchy bipartisan slogan, but take it for what it is—a facile phrase without an anchor in the city’s history. National Treasures: Save the Tidal Basin. Take the Pledge. Washington may not be built on a swamp, but rising sea levels do threaten American icons like the National Mall Tidal Basin. Join our multi-year campaign to save this historic place.